Sven Haakanson, the curator of North American Anthropology at the Burke Museum, says he wants exhibits at the new museum to speak to the resiliency of North America's Native people. Museum curators in the Northwest are now working to update exhibits that focus on the region’s indigenous people. They are trying to do that in a way that both modernizes stories of indigenous people and tells them more truthfully. The last time you went to a natural history museum, you may have seen glass cases filled with the costumes, jewelry and tools of the native people who are still living in the Northwest. “Entering a museum and seeing artifacts or seeing objects from my tribe is heartbreaking,” said Polly Olsen, a member of the Yakama Nation. She’s also the tribal liaison for the Burke Museum in Seattle. She said placing Native American objects—like a handmade huckleberry basket—behind glass takes away its life. In anticipation of a brand-new Burke Museum opening next year, Olsen has been meeting with elders from tribes across the region. She wants to make sure new exhibits depict that living spirit. For example, instead of simply displaying a basket with the date it was acquired, the object should tell a story, Olsen said. “We would like to change that to be a statement of ‘a Colville basket that is used to gather huckleberries during the late summer.’ And you have an understanding of what the item is used for, where currently you look at the items and you don’t fully understand its purpose," she said. 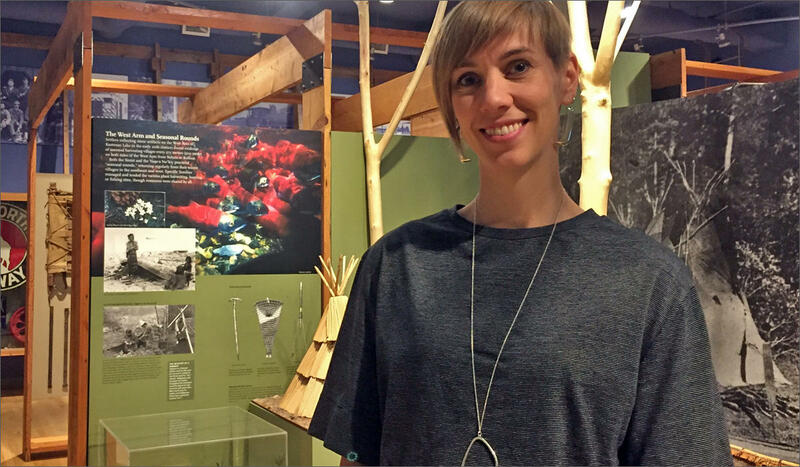 Polly Olsen is the first-ever tribal liaison at the Burke Museum. 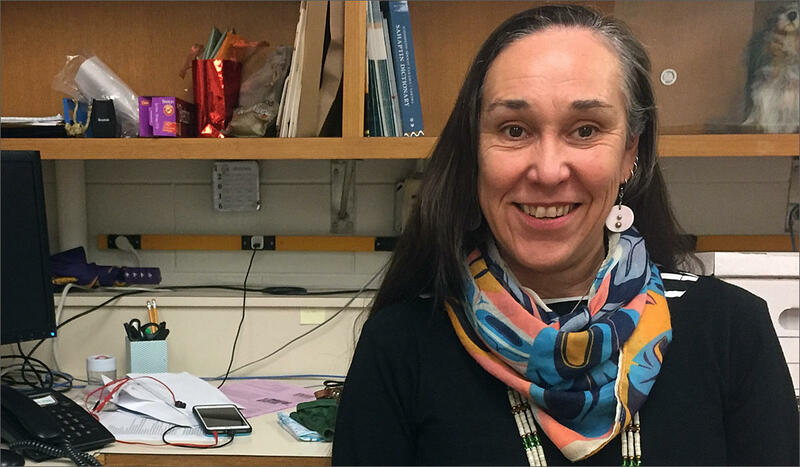 A member of the Yakama Nation, she was hired last year to consult with tribal elders across the Northwest so that their stories could better be told when a new Burke museum opens its doors next year. This is the kind of rethinking that’s starting to take hold in museums that house Native American objects. Curators are ready to tell a more complete story than what’s been told in the past. It’s what is happening at a museum in British Columbia that houses an exhibit about the Sinixt people, who once occupied a huge stretch of land from the Colville Reservation in northeastern Washington all the way north to Revelstoke, British Columbia. “It’s very clear that this land was occupied for thousands and thousands of years before settlers came,” Touchstones Nelson Museum of Art and History Executive Director Astrid Heyerdahl said. At the Touchstones Nelson Museum of Art and History in Nelson, British Columbia, Executive Astrid Heyerdahl says it's time to tell a more complete story of what has happened to the tribes in the region since white settlers arrived. She pointed out a row of glass cases on the second floor of the museum that hold all kinds of items that once belonged to the Sinixt. In 1956, the Canadian government officially deemed the Sinixt ‘extinct.’ Currently, 4,000 members of the tribe live in Washington state, pushed off their traditional lands as settlers migrated west. But the story isn’t clear when you visit this museum. “People really want to see themselves represented and represented properly, with honesty, with truth, recognizing the true history of this area and bringing in opportunities to talk about current events in relationship to history,” Heyerdahl said. Heyerdahl is working with the community to modernize that story by 2021. Like at the Burke, they are also consulting with tribal members. There are some very painful stories in indigenous history. Many Native people suffer from generational trauma. There’s the controversial efforts of missionaries to bring Christianity to tribes, and there’s the ugly truth of how indigenous people were displaced both from their lands and their culture. “We will talk about language suppression, we will talk about displacement, we will talk about reservations,” said Sven Haakanson, curator for North American Anthropology at the Burke. He’s also Alaska Native. He said the list of injustices is long, but they don’t complete the main story. “That’s what we want to share is the resilience of all communities,” Haakanson said. “Even under the circumstances that we have been put, there is so much resilience and using the objects as a way to get communities to see that and also then take ownership of it, so they own it, not us," he said. Correction: Our original story misspelled Astrid Heyerdahl's name. We apologize for the error. Right next door to the current Burke Museum at the University of Washington in Seattle is a much larger building under construction. When it’s complete, it will serve as the new state Museum of Natural History and Culture. British Columbia is taking the next step in a decade-long battle over native tribal rights. The province has filed paperwork to appeal a decision that granted Washington state tribal members rights to their ancestral lands in Canada. Tribal members are waiting for the next move from British Columbia’s provincial government in a long-running battle over sovereign rights. Last month, a British Columbia Supreme Court judge ruled against the province, siding with a Washington man in an illegal hunting case.